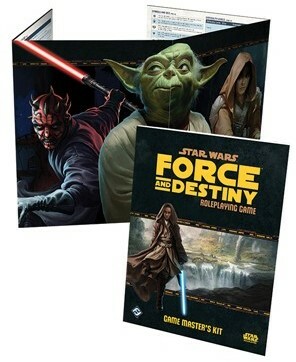 Star Wars Force and Destiny RPG - Game Master's Kit. Master the Force and focus on the action with the Star Wars®: Force and Destiny Game Master’s Kit. It contains a complete adventure, Hidden Depths, and a GM screen that keeps tons of well-organized, useful information such as weapons data and critical injury results right in front of your eyes during gaming sessions. Expanded rules for Knight-level play are also included, allowing you to start players off with developed Talents and incredible Force powers.